Lucas getting ready to leave on trip at the docks. Camper Mom, Catrien Bouwman, talks to us about her experience with Wanapitei and her son, Lucas, who completed his second year in the Junior program in 2013. What made you want to send your son to summer camp? 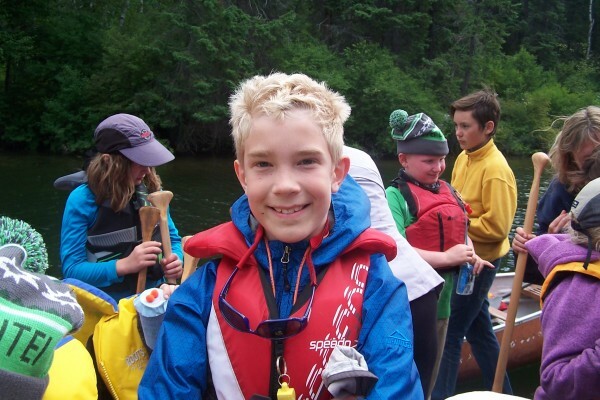 Mark, his Dad, had gone to summer camps as a kid and he had very formative experiences at camp – he loved it. I always wanted to go to camp. We both knew that we wanted our kids to have the camp experience. Why did you choose Camp Wanapitei? It’s a good fit for number of reasons – Lucas has always been drawn to canoeing, water, lakes – nature in general. His Dad is very interested in canoeing and whitewater – he had heard of Wanapitei and that it was a good camp. I knew that you (JJ) and Woody would be good directors. We were sending Lucas to people that we trusted – that was a big part of it for me – the trust that I have in the leadership of the camp. As a parent, what was a highlight for you with respect to your experience with Wanapitei? For me, I think a highlight is when we came to pick him up this year and we saw how happy and at ease he was at camp and how he was interacting with the other kids and the counselors – we knew that he had a good experience. We could tell in his body language when we first saw him. Another big highlight was going to the banquet and seeing all of the camper groups doing their skits – you get to see what really happens and how the kids interact with each other in positive ways. Did you see any results or differences in your son after being at Wanapitei? After Wanapitei, he is much more motivated to learning paddling strokes – he really likes learning paddling strokes and feels proud of his paddling. What would you tell a new camper family considering Wanapitei for their child or children? It’s such an incredibly high quality camp – the counselors are all amazing people – any interactions that I’ve had with any counselor individually has only increased my respect for the camp in general. They can expect their child to have very personal attention – not to fall through the cracks. I love that at Wanapitei it’s in real time without technology and screens – they really go out into nature full on.